शं नो वरुणः which means May the Lord of the Water be auspicious unto us is the motto of the Indian Navy that stands strong and resilient for the protection of the country and its people. To honor and commemorate the sacrifices and achievements of the Indian Navy 4th December is celebrated as the Indian Navy Day every year. It is a day of immense honor and pride for the entire country. The Indian Navy Day celebrations are organized two months prior to the Navy Day on 4th December. These line of events are aimed at showcasing the ‘Silent Service’ and raise awareness among citizens by engaging with them. The celebrations this year started with a Mega Blood Donation Camp organized by the Eastern Fleet at the Naval Dockyard Visakhapatnam on 05 October 2018. Other events that are initiated as a part of the Navy Day celebrations include an Organ Donation Seminar, Special Children visit to INS Dega and Eastern Fleet ships, Public presentation of Naval Band, two additional Blood Donation Camps and an Outreach Program, a Medical Camp in November along with the popular Vizag-Navy Marathon on 18 November 2018. On the 24 and 25 November 2018 naval ships will be open to school children. The supreme naval branch of the armed forces of India was founded in 1612 by the East India Company and post independence was renamed as the Indian Navy on 26th January, 1950. It was originally called the Royal Indian Navy. 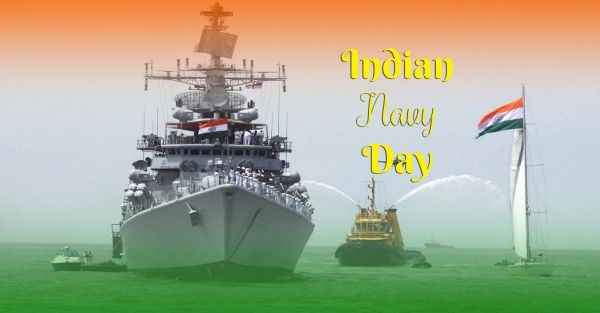 Navy Day does not memorialize the day the Indian Navy was founded. It rather commemorates the remarkable day when the Indian Navy successfully accomplished the Operation Trident (an attack on the Pakistani Naval Headquarters in Karachi). The first Independent mission executed by Indian navy was against the Portuguese Navy during for the freedom of Goa in 1961. Indian Navy personnel played a key role in the World War II. The small feet of Indian Navy led to an expansion in vessels and personnel. The huge number of Indian merchant seamen and ships were remarkably helpful in maintaining the large flow of raw material and materials from India to the United Kingdom open. In the 1971 Indo Pakistani War, the Indian Navy was instrumental in executing a blockade, shipper aircraft bombing missions and cruise missile strikes in opposition to land targets. They used anti-ship cruise missiles to demolish Pakistani oil tank farms which were quite innovative strategies for its time. The Indian Navy is the Fifth Largest Navy in the World. The strength of this massive Naval Army lies in the 58,350 personnel, an aircraft carrier, a big transport dock, 15 frigates, 8 guided missile destroyers, 24 corvettes, 13 conventional submarines, 1 nuclear attack submarine, 30 patrol vessels, 7 mine countermeasure vessels including a variety of auxiliary ships. What makes Indian Navy unbeatable is that it is the only country with supersonic cruise missiles in the Indian army, navy, and air force. W hat adds is that the Indian Brahmos missile is the fastest missile with a speed of Mach 2.8- 3.0. The Kerala’s Ezhimala Naval Academy is the largest naval academy in Asia. The Father of Indian Navy is - Chhatrapati Shivaji Raje Bhosale. He built a strong naval force in Konkan and Goa to protect sea trade. Indian Naval Ship Viraat was the oldest aircraft carrier in the world and the second aircraft carrier of the Indian Navy is the INS Vikramaditya. And INS Vikrant is the first aircraft carrier that was manufactured in India. India now develops most of its naval ships and submarines indigenously. Indian Naval Ship Arihant is the lead ship in India's nuclear-powered ballistic missile submarines. It is a massive 6,000 tonne vessel. The Sagar Prahari Bal (SPB) created in March 2009 post the 26/11 Mumbai attacks is the component of the Indian Navy in charge for patrolling India’s coastal waters. MARCOS or Marine Commandos, nicknamed magarmach, are the undercover and secretive special operations unit of the Indian Navy. The MARCOS undergo the toughest Indian training and almost 90% of them drop out during the training and recruitments. They can go through operations in any terrain. Saagar Pawan of the Indian Navy is amongst the two naval aerobatics teams in the world. GSAT-7 is the multi band communication satellite used by Indian Navy. The Indian Navy has been successful in carrying out an expedition across the North Pole and the South Pole. Indian Navy is the first Navy to send a submariner to a voyage to Mt. Everest. The present Indian Navy flag has St. George’s Cross design, a part of the Union Jack.